Fabri-Tek has many customers in the fenestration industry that we supply our “Strat” PTFE tapes and fabrics to currently. This is a proprietary and premium product that is outlasting any of the other PTFE welding tapes in the marketplace. 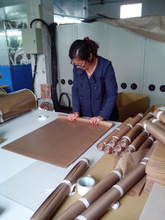 We provide this material in cut to width rolls of just fabric and also in tape with a Silicone adhesive one side. The PTFE fabric and tape are used as a release medium for UPVC window welding equipment covering the high temp platens that weld the corners of the PVC window extrusion together. Our PTFE fabrics and tapes are used on window welding equipment manufactured by Actual, Urban, Rotox and various other manufacturers.